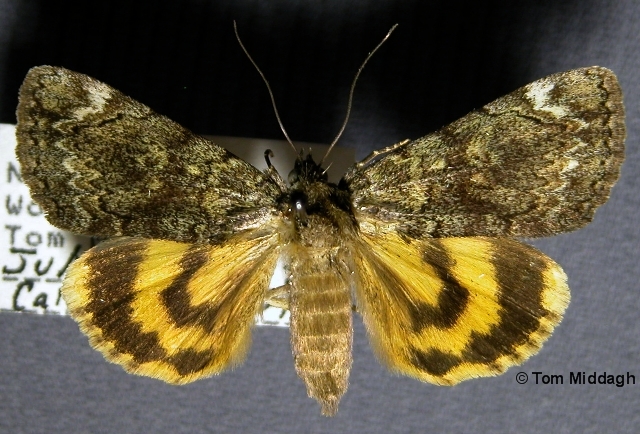 Identification: Forewing mottled light and dark brown; note white st. line that widens toward costa. Lines black, indistinct except zig-zag pm. line; black shading along am. line. Hindwing yellowish orange with black bands that bleed into background toward inner margin. Median loop rounded (rather than pointed, as in Little Nymph); marginal band complete. Caterpillar Hosts: Honey locust and water locust. Range: New York to Florida, west to South Dakota and Texas.